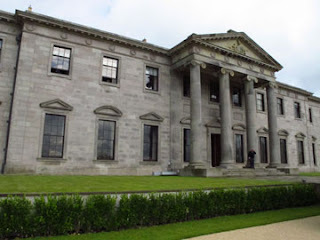 Most of my travels find me overnighting in reasonably modest accommodations, but I felt like--and was treated like--royalty during my stay last June at Ballyfin, a lavishly restored Regency Irish mansion . Ballyfin is one of the most historic houses in Ireland, a significant 19th century mansion built in the 1820s for Sir Charles Coote who purchased the property in 1812 from William Wellesley Pole, brother of Duke of Wellington. The Cootes owned the house for a hundred years before selling the estate in 1928 to Patrician Brothers who ran a successful school there. Brother Maurice Murphy had a particular fondness for the house; so when the school no longer was profitable and the buildings had deteriorated, he sold it to the present owners who opened it for guests in May 2011. Upon entering the house for our hosted visit, my husband and I could see that it was built for entertaining. After Coote married in 1819, he and his bride toured Europe collecting suitable furnishings for the house, which was completed in 1826. Sir Coote was a member of Parliament from 1820-1850 and entertained lavishly during the six months a year the couple spent at the estate. It was entirely self-contained, growing all fruits and vegetables on premises, including bananas in the conservatory, which was considered the height of luxury. During the last decade, the home was painstakingly restored to preserve this part of Ireland’s architectural heritage. One of the few structural changes needed was converting dressing rooms to bathrooms. Mahogany doors and windows are all original. Inlaid mahogany wood flooring, decorative Spanish motifs, floral patterns in plaster, and elegant stucco work are reminiscent of the period in which it was built. 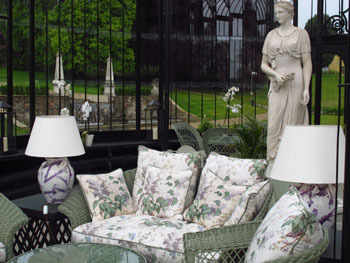 Highlights of the grounds include an enormous lake, 18th century grotto, and medieval tower. The intent is for guests to feel like they’re staying in a country home instead of a hotel, not hard since there are only 15 rooms. Hospitality is impeccable, linens are 100 % white damask Egyptian cotton made in Italy, and guests enjoy complimentary room bar, laundry service, shoe cleaning, and umbrellas and Wellington boots. After our exquisite dinner of organic salmon we convened in the bar and listened to music from a trio of musicians playing Irish harp, flute, and accordion. 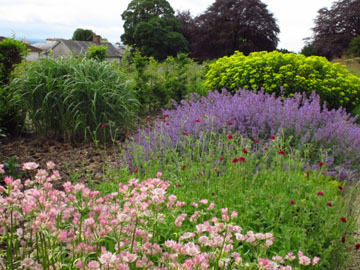 Stroll through the gardens at Ballyfin. Public areas include the “whispering room,” a small morning room with an echo; an 80 by 30–foot library, the biggest room in the house; and a gold drawing room for ladies. The conservatory, added in 1855 as a place to bring visitors and grow exotic plants, is now a cheerful sitting room decorated with orchids and green and purple upholstered wicker furniture. A cascade at the rear of the house is reminiscent of Lake Como. 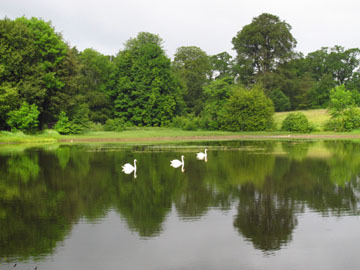 Swans and trees reflect in the shimmering lake. Maps, paintings, early photographs, archival documents, and diaries helped restore the landscape to 18th and early 19th century form. Lovely gardens are open to the public. Larry and I explored some of the eight miles of paths that wander through woodlands and around the 614-acre estate on provided bicycles; canoes and golf carts are also available. 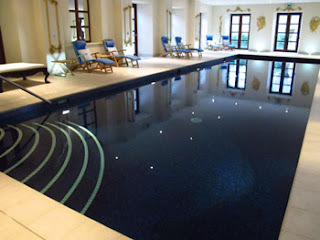 A pool, tennis, croquet, archery, falconry, bird watching, star gazing (telescope in the tower), music recitals, wine tastings, art and architecture tours, fishing, spa treatments, and golf (three courses within 50 miles) guarantee plenty of activity if that’s your choice. Lights twinkle in the deep blue pool. Ballyfin is 35 miles from Kilkenny and 60 miles from Dublin, either of which makes a fine daytrip. 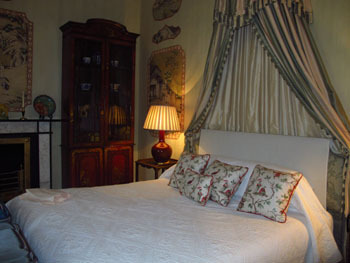 We had a wonderfully extravagant but totally satisfying experience in this magnificent five-star Irish mansion.